Apple CEO Tim Cook took the stage at the company's annual Worldwide Developers Conference in San Francisco on Monday to announce the latest features for iPhones, iPads and Macs. Apple (AAPL) unveiled iOS 8, an update to the operating system that powers iPhones and iPads. It will be available for download in the fall. One of the biggest additions to iOS 8 is a new HealthKit application. The app will monitor users' heart rates, sleep, weight and blood pressure among other health-related information. HealthKit will allow clinicians at the Mayo Clinic to send health information to a user's app, which can in turn send that data to a user's primary physician. It also syncs with third-party fitness devices and apps. Apple also unveiled HomeKit, a new platform that would enable people to control all the items in their homes with the iPad or iPhone. That means iOS 8 will let people manage their lights, cameras, door locks, switches, plugs, thermostats and other connected devices. But other changes are far more subtle than in years past. After last year's complete makeover, iOS 8 includes oft-requested fixes, such as interactive notifications, suggested words when typing, quicker access to contacts, widgets and inter-app communication. With interactive notifications, iOS 8 will allow users to respond to texts or like something on Facebook (FB) directly from the notification -- even on the lock screen. A double tap on the home button reveals several frequent contacts, allowing you to call, message or email those people with two quick taps. And a new predictive text feature allows you to type, and iOS 8 will suggest the next word based on your typing history. For the first time, iOS will also feature widgets in the notification center. Widgets will allow users to view app information at a glance, including sports scores and weather data. Inter-app communication means that iOS 8 users will soon be able to install third-party keyboards and let translation apps automatically translate text in other apps. The new iOS 8 also will include improved group messaging. Users can send audio and video messages and leave a group text with a new do not disturb feature. There also is a self-destruct feature similar to social media startup Snapchat. A family sharing feature allows parents to track their kids' locations and seek approval on their iPhones or iPads before their kids can purchase new apps on their own devices. And the new photos app displays all photos on iCloud -- even those that aren't stored on a user's device. 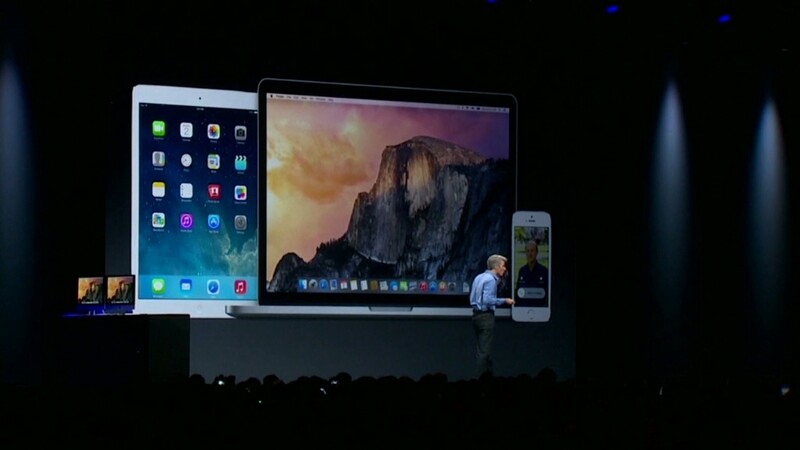 Apple also unveiled the new operating system for the Mac, dubbed Mac OS X Yosemite. It got a big design update, making the interface for Macs look much more iPhone- and iPad-like. Like iOS 8, it will be available as a free download to Mac users in the fall. Mac OS X Yosemite features a revamped "spotlight" search feature that searches across the Mac and Microsoft Bing (not Google (GOOGL) interestingly). The new iCloud Drive feature syncs all Mac folders across every Mac, iPhone or Windows PC that a user owns. That feature is like cloud storage service Dropbox. And a new "handoff" feature allows Mac users to place and receive calls and texts via their Mac, even to non-iPhone users. 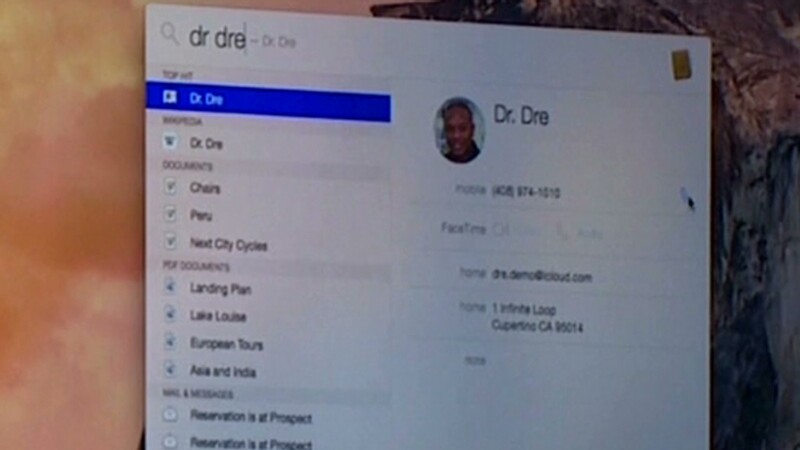 Apple's software chief Craig Federighi showed off the feature by calling Dr. Dre -- one of Apple's newest employees after the company purchased Beats Electronics for $3 billion last week. The new Mac OS has a Windows-like translucent look as well as a "dark mode." Speaking of Windows, Cook noted that 51% of Mac users are already using the latest version of Mac OS X, called Mavericks -- a free update for Mac OS X customers. Just 14% of Microsoft (MSFT) Windows customers are on Windows 8, though users of previous Windows iterations have to pay to upgrade to the latest version.